“I was always ahead of the game. Where other people hesitated, I was already on my way,” says 97-year-old Jac. Linssen. This enormous drive for continuous innovation helped him to get through turbulent times and build a glorious yachtbuilding business. “So Jac., now show what you can do,” Jac. Linssen said to himself as he slid the key into the lock of his own carpentry business on 1 April 1949. He didn’t have much time to think about it, because a neighbour promptly threw his garden gate into the courtyard. Could Jac. Linssen fix it for him? This was the start of what would later develop into a major yachtbuilding business, Linssen Yachts. For two years, Jac. Linssen worked on the farm against his will, for as a fourteen or fifteen-year-old he had no other choice. But after those two years, his patience was exhausted. Fortunately, Linssen’s father was now behind his son’s choice, and after a lot of urging, he said that Jac. would have to look for another job. “That wasn’t easy. It was the early 1930s, and there was a depression. But I had made my plan. I wanted to become an architect, if necessary working in construction, because that’s where people draw, where houses are built.” Jac. Linssen ended up working for carpenter Sef Hanne, who taught him the tricks of the trade. He started out as an errand boy, but very soon he was making pieces that others had not yet mastered after three years of woodworking. On 6 December 1937 Jac. Linssen joined Tinnemans-Houben (run by the foster son and son-in-law of his mentor Sef Hanne), a firm specialising in metal, engineering and woodworking. That day, for the first time, Jac. Linssen crossed a gangway on to a ship. Laying a floor, repairing a truss... That’s how Jac. Linssen came into contact with ship interior design at a very early stage. However, after only a year, the business split up and Jac. Linssen initially joined Tinnemans’ company, because it focused mainly on woodworking. Houben’s company started to focus more on metalwork. In other words, Jac. Linssen was already a good craftsman at a very young age. Nevertheless, for four years he cycled to Echt in the evening after work to attend the architectural drawing department of the technical college, because he still wanted to become an architect. Later, he also attended commercial college in the evenings. Seven months before the liberation of Maasbracht, the retreating Germans ordered everybody on board the 240 barges that were in port at that time, to leave. One day later, on 30 September 1944, Jac. Linssen saw with his own eyes the inland vessels being dynamited and sunk one by one. The barge skippers’ families were out on the street and Maasbracht harbour was transformed into one big ships’ graveyard. On Jac.’s 23rd birthday, 24 January 1945, Maasbracht was liberated. Shortly afterwards, his former employer Sieb Houben came to Jac. Linssen and asked him if he wanted to head up the large salvage team tackling the ships’ graveyard. All the wrecks had to be cleared away. Jac. Linssen remembers it well: “’I need you,’ said Houben.” You know all about boats, understand the mentality of the barge skippers and can deal with them. You can also estimate values and assess whether the wood can still be saved or whether it has been spoiled by the water.’’’ Eventually, 165 out of 240 vessels were repaired and rebuilt under his leadership. 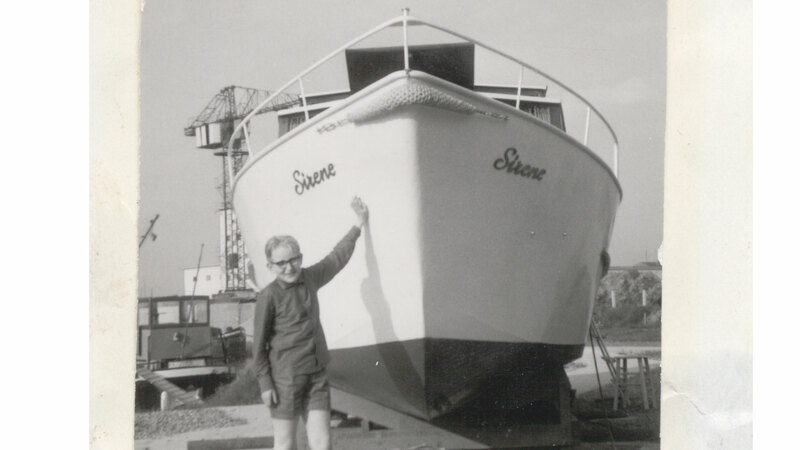 In 1948 Houben stopped repairing boats and the firm continued making boilers. The time had come for Jac. Linssen to start working for himself. His ambition to become an architect had been overruled by the trade into which he had actually been enrolled automatically in recent years, partly due to working on the ships’ graveyard. His wife Anneke, whom he married in 1948, fully supported him in his plan. “Anneke stood before me, stood next to me and especially stood behind me,” says Jac. Linssen. And his father-in-law allowed him to use the empty shed next to his house. So, on 1 April 1949, he turned the key in the lock of his own business, which he named Machinale Houtbewerking St. Jozef. Things were not easy at the beginning, says Jac. Linssen himself. At first, he met with a lot of opposition from owners of the surrounding businesses, who saw Jac. Linssen as a major competitor as a furniture maker and ship interior builder. Jac. Linssen tackled any job that came his way, whether it was a garden gate or a wooden garage for a neighbour. And soon the first skippers started to appear. He can still remember the first one very well. “Skipper Ter Velden. I made him a new wheelhouse. Of course it was just that bit nicer, that bit more refined than the one he had before.” This skipper was so happy with the result that he later sent three fellow skippers to Jac. Linssen for new teak wheelhouses. After three years, Jac. Linssen had already grown out of his father-in-law’s shed and built a new “factory” behind his own house (which was next to that of his parents-in-law). But Jac. 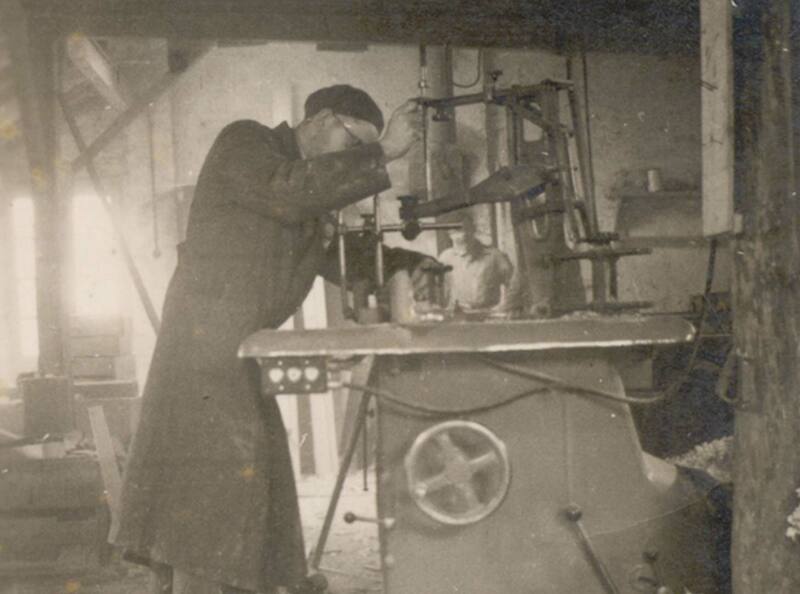 Linssen never forgot his first helping hand: “My father-in-law helped me so much by giving me his shed that I was later able to establish ‘the most beautiful carpentry factory in the south of the Netherlands’”. Of course, a lot of teak was left over from these large planks. However, Jac. Linssen didn’t allow his workers to burn this expensive wood in the stove. “I wasn’t frugal when I had to be generous but, above all, I wasn’t generous when I could be frugal. I hated throwing good material away.” But what do you do with so many small pieces of teak? I’m going to make steering wheels out of them, Jac. Linssen thought. A steering wheel consists of many small segments, for which he could make perfect use of the “scrap wood”. Many colleagues and skippers said he was crazy. After all, there were only two companies in the Netherlands that could make steering wheels, namely Koets in Hoogezand and Van der Staay in Ridderkerk, and they had been doing so for almost a hundred years. “Well, I’m going to do it for another hundred years,” said Jac. Linssen defiantly when another skipper expressed doubt about his idea. And after hours of drawing, fitting, measuring, drilling, sawing, carpentry and sanding, his first steering wheel was finished. His design, featuring a patented hub, was so robust that in the Belgian Congo they called it the only tropical steering wheel that exists. “Because of the hot and dry conditions, other steering wheels quickly became wobbly, but mine could be adjusted every time.” Jac. Linssen had developed a cast iron hub in two parts, into which not only each spoke was screwed, but gibs were also bolted through the hub between all the spokes. If anything came loose, it could always be tightened again with a spanner. By the first half of the 1950s, Jac. Linssen had already reached the point where he could carry out complete ship repairs. Expansion was therefore desperately needed and for this purpose temporary premises were built for both woodworking and metalworking at the bunker port in Maasbracht. “There we also started making rowing boats and the first wooden speedboat”, says Jac. Linssen. The first real steps towards the future Linssen Yachts had been taken. 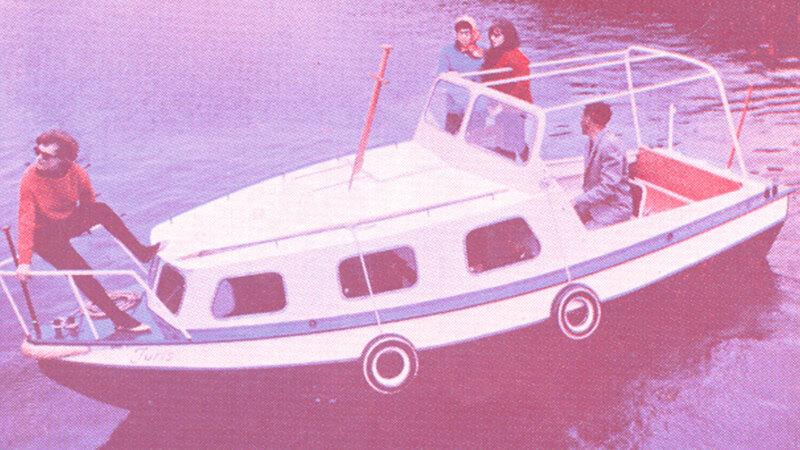 In 1957 the first motor yachts followed, naturally enough designed by Jac. Linssen himself: the St. Jozefvlet 500, 600 and 700. In 1964 Jac. 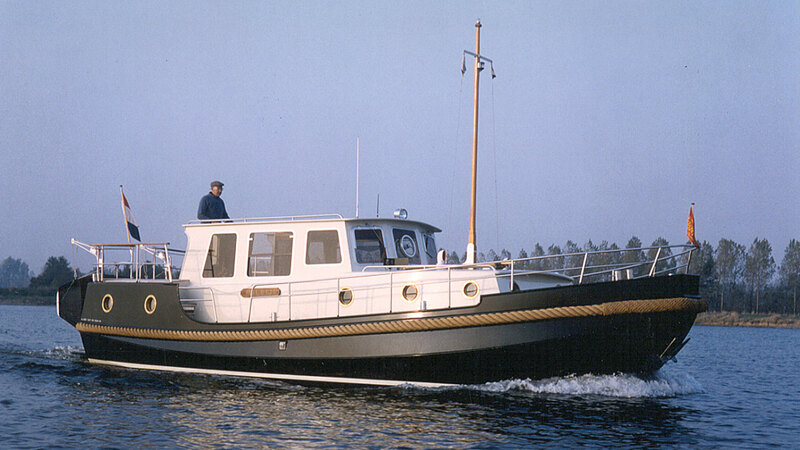 Linssen developed the first cruisers: the Limburgia series. At first they were 8.30 metres long but, at the request of customers, that later became 8.50 metres and then 8.90 metres. But in 1966 Jac. Linssen got the fright of his life. The new government increased the tax on recreational craft from 4 percent to a whopping 18 percent. “I watched the draft budget announcement on TV with my heart in my mouth. During dinner, two customers called to cancel their orders. The tax increased by 14 percent. A huge amount. Later that week, another six customers cancelled their orders. I think I had fourteen yachts on order. More than half were cancelled.” That was also the first time that Jac. Linssen had to let go a number of good craftsmen. With a heavy heart. More customers called to cancel their boat, but Jac. Linssen was able to come to an arrangement with them. He would absorb half of the additional 14 percent tax. “I was able to save the situation by doing so. Unfortunately, I did lose some good workers at that time.” After fierce protests from the trade association, Hiswa, and marina associations, the scheme was later relaxed; the engine, the inventory and everything that was not attached to the boat were not subject to the tax measure. Despite this, the slump in boat sales lasted a few years. Jac. Linssen managed to keep his head above water by making interiors, including for shops and businesses. A number of craftsmen even came back. In 1968, Jac. Linssen gained a welcome additional member of staff when his eldest son Jos joined the company. Initially, father and son continued with their core business: ship repair. Later, however, there was so much interest in pleasure craft that one day Jos Linssen asked the question: “Shouldn’t we be making a choice?” After all, the two parts of the business were so different in terms of refinement, construction, weight... “If you’re welding a filthy black barge, the new, finely painted yacht next to it can get damaged just like that,” says Jac. Linssen, who also realised that things could no longer continue as they were. In 1970, the switch was made and Jac. and Jos Linssen focused entirely on yacht building. But one day people came to check out a new boat. Luckily, Jac. and Jos Linssen still had a Limburgia, so they could test sail it there and then and the boat was sold immediately. The business gradually started to flourish again and when Jac. and Anneke Linssen came home one day from a holiday in Friesland, Jos had designed six new boats. “’The crisis is over, we’ve got to have something to do,’ Jos said to me. It’s unbelievable how that happened,” says Jac. Linssen now. By this time, his sons Jan and Peter had also joined the company. Jan was sent to run a branch in Noordoostpolder. From there, Jac. Linssen had thought, tourists could easily sail to Friesland. However, even after five years no progress had been made. Sailing to Friesland on a free Sunday was impossible because the locks in this area were not operated on Sundays. Jan therefore returned to Maasbracht. Jac.’s son Harry had also been brought in by now and initially devoted himself to the production of steering wheels. However, the demand for steering wheels declined as hydraulic steering came on to the market. The steering wheel became an exclusive product. And Linssen now had so much continuous yacht building work that it became more of a burden. “One day Jos told me he was going to stop making the steering wheels. Although I understood why, I thought it was a great pity as nobody could make them better. By then, Harry had become so familiar with the business that he could be deployed anywhere in the company. In 1975 Jos Linssen took the helm. The firm had 35 to 40 employees at the time of the handover. At that time, St. Jozef was one of Maasbracht’s larger businesses. “I could never have imagined that it would eventually be like this,” says Jac. Linssen. “I always aimed to have a business with six or seven employees, in which I wandered around in overalls and helped out.” Jac. Linssen wore those overalls for a long time. He always spent half his time in the factory and half in the drawing office. “Even my old mentor Hanne took his hat off to me one day and said, ‘You’ve done well.’ But the biggest boost to the company’s growth and expansion to make it what it is today is really down to Jos. I’ve nothing but praise for him! No-one can match him,” Jac. Linssen concludes.